Our audio upgrades are specially designed for your BMW and 100% retrofittable. Enjoy superior sound, more dynamics and powerful low frequency reproduction. High-quality speakers forming the basis of our upgrade systems. Not only are they from better quality than standard speakers, but rather they are also more durable. Our subwoofer is 67% larger than BMW’s standard woofer due to its perfect fit. The bass sounds fuller, more spacious, also much deeper and produces an incredibly dynamic sound. A missing tweeter is a weakness of the BMW standard audio system. All BOXMORE BMW sound systems are supplied with a high-quality 25 mm soft-dome tweeter, which guarantees incredible detail resolution in the high frequency range. The BMW GT system is the cheapest upgrade, but a significant improvement on the standard system. Complete with six speakers, amplifier, plug & play cable set and acoustic insulation material. The interior and placement of the speakers in the car have a significant influence on the sound quality. The disadvantageous effects are largely compensated by a professionally programmed digital sound processor (DSP). Using digital time correction, equalizers and active crossovers, our sound engineers make it possible to perfectly match the audio system to the car’s acoustics. The result is a crystal clear, natural representation of voices and instruments. Good is not good enough? Lovers of unprecedented dynamics and powerful sounds at maximum volume choose the EXTREME DSP system. Thanks to the more powerful woofer, the sound pressure in the woofer range is increased even further. Our GLADEN BOXMORE speakers are designed to integrate perfectly into the interior of your BMW, both visually and acoustically. We use a mixture of high-quality and traditional materials in a proven concept. The result is a transparent and natural reproduction of sound that is more powerful and detailed. In our audio upgrades for BMW we use a soft-dome tweeter for detailed and sparkling sounds. Thanks to the fabric dome tweeter and the sophisticated design, these tweeters play linearly over a wide bandwidth. In addition, our perfect fit blends invisibly behind the speaker cover. If your BMW does not have tweeter covers ex works, they can be retrofitted with original BMW parts. Installation is also possible with our retrofit grilles included in the content of delivery. Your local GLADEN dealer will be happy to provide you with more information. BMW installs a 165 mm bass driver under the front seats. Since there is room for larger woofers, GLADEN has developed specially for the BMW woofer with a diameter of 200 mm, which also have a much higher power handling capacity. They therefore enjoy a warm and rich low-frequency reproduction, as well as controlled kick basses that remain detailed and clear at high volumes. More dynamic and maximum enjoyment. Thanks to the high quality of the 520 watt / 610 watt amplifier, the sound remains clear and dynamic even at full volume. Our loudspeakers fit perfectly into the installation positions provided by BMW. Thanks to the Plug & Play cable sets, the vehicle remains unchanged in its original condition without modification. The installation of a BOXMORE BMW sound system in a modern BMW should be done by experts. Let your BOXMORE Audio Upgrade be installed by a specialist dealer in your area. Thus you receive 1 year warranty on the GLADEN components. 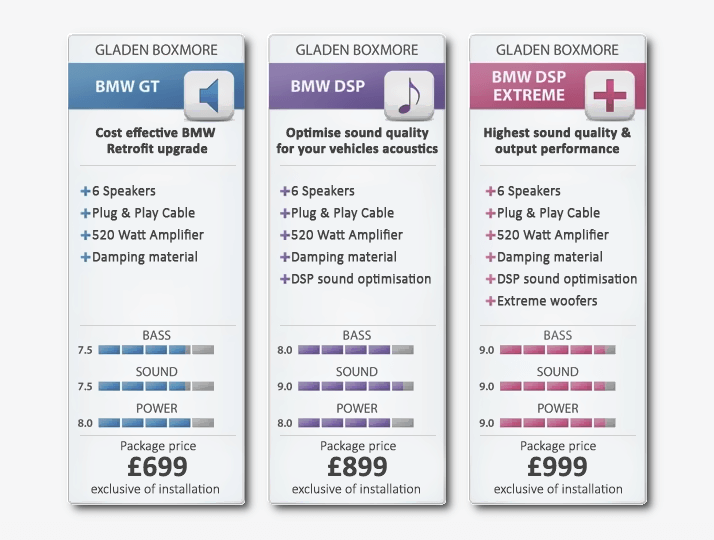 There is a GLADEN BOXMORE upgrade solution for almost every BMW (equipment dependent) from model year 2001 (from E60). See the compatibility list for the latest models. Is your model not included? Or do you have any questions? Contact your nearest GLADEN dealer. Please have the VIN (chassis number) of the vehicle ready! Clear compatibility can only be checked by using the VIN. * £69 extra for GT & DSP system.